Image caption Tha dòchas gun cruthaich an làrach ùr 2,000 cosnadh ùr tro obraichean saidheins agus foghlaim. 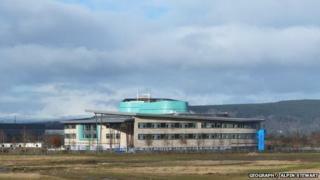 Dh'fhosgail campus ùr ann an Inbhir Nis, a chosg £100m, agus bi Oilthigh na Gàidhealtachd 's nan Eilean stèidhichte, am measg bhuidhnean eile, Dihaoine. Bidh oifisean Oilthigh na Gàidhealtachd 's nan Eilean (UHI) stèidhichte aig an làraich, a thuilleadh air togalaichean na colaiste agus grunn chompanaidhean coimearsalta a tha an sàs ann an roinn nan saidheansan-beatha. Nuair a chaidh Oilthigh na Gàidhealtachd agus nan Eilean a' stèidheachadh bha an fheadhainn a bh' air a chùlaibh ag ràdh gur e aon de na rudan a bu tharraingiche mu dheidhinn, gun robh 13 colaiste agus buidhnean rannsachaidh uile mar phàirt dheth, agus iad sgapte air feadh na sgìre seach a bhith air aon làraich a-mhàin agus leanaidh sin. Chaidh an làrach ùr a dhealbh cuideachd gus am biodh cuid de na buidhnean rannsachaidh aig an oilthigh stèidhichte ann, a thuilleadh air feadhainn ùra a tha an sàs ann an leigheasan agus saidheans. Aig a cheann-thall thathas an dòchas gun tèid còrr agus 2,000 cosnadh a chruthachadh tro obraichean saidheins agus foghlaim.